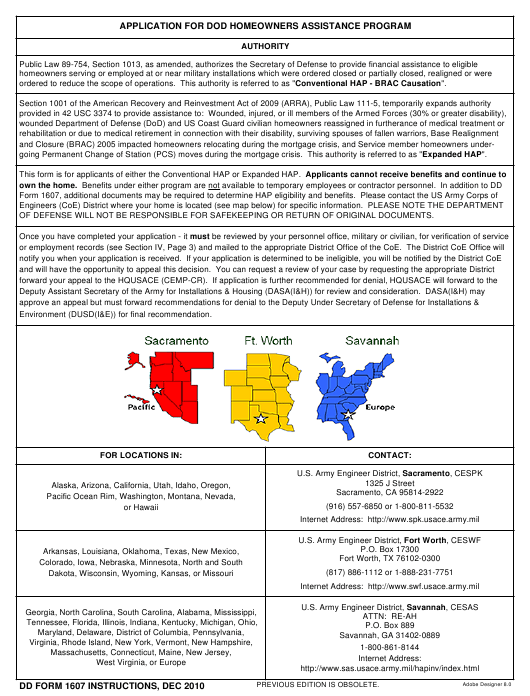 DD Form dd1607 - also known as the "Application For Homeowners Assistance" - is a Military form issued and used by the United States Department of Defense. The form - often incorrectly referred to as the DA form dd1607 - was last revised on December 1, 2010. Download an up-to-date fillable DD Form dd1607 down below in PDF-format or find it on the Department of Defense documentation website. ordered to reduce the scope of operations. This authority is referred to as "Conventional HAP - BRAC Causation". going Permanent Change of Station (PCS) moves during the mortgage crisis. This authority is referred to as "Expanded HAP". OF DEFENSE WILL NOT BE RESPONSIBLE FOR SAFEKEEPING OR RETURN OF ORIGINAL DOCUMENTS. Environment (DUSD(I&E)) for final recommendation. AUTHORITY: Public Law 89-754, Section 1013 and Executive Order 9397. PRINCIPAL PURPOSE(S): To determine eligibility for benefit and process requests for the Homeowners Assistance Program. to determine tax liability for sale of property to the Government. denial of benefits provided under this law. would be 20080601). Complete all sections of the form as indicated. closure. Documents provided in evidence of purchase, sale, and foreclosure must be legible, completed copies. THE DEPARTMENT OF DEFENSE IS NOT RESPONSIBLE FOR SAFEKEEPING OR RETURN OF ORIGINAL DOCUMENTS. g. TO THE BEST OF YOUR KNOWLEDGE, DOES THE DWELLING CONTAIN ENVIRONMENTAL HAZARDS? Fine of not more than $10,000 or imprisonment for not more than 5 years or both (See 62 Stat. 698, 749; 18 USC 287, 1001). amount of damages sustained by the United States (See 31 USC 3729). COMPLETE TO THE BEST OF MY KNOWLEDGE AND BELIEF. time by doing so in writing. This Consent is valid for one year from the date of authorization. a. THE EMPLOYMENT/SERVICE INFORMATION SHOWN ON THIS FORM HAS BEEN VERIFIED AND IS CORRECT AS STATED IN ITEMS 1, 8, AND 10.